Euboia, Chalkis. Silver drachm. 340-294 BC (or slightly later). Chalkis. 340-294 BC or possibly slightly later. Size : 16.1 x 16.5 mm. Weight : 3.55 grams. 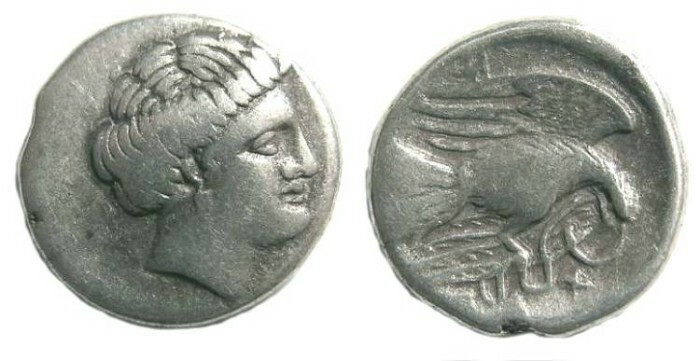 Obverse : Head of Hera right, with slightly crude style that Sear lists as being possible a slightly later issue than the the finer style issues. Reverse : Eagle flying right, carrying a snake, with a Greek inscription below, naming the city (only one letter is visible).